Best business writing tip ever: Walk away! What’s the best way to improve your writing? Walk away! 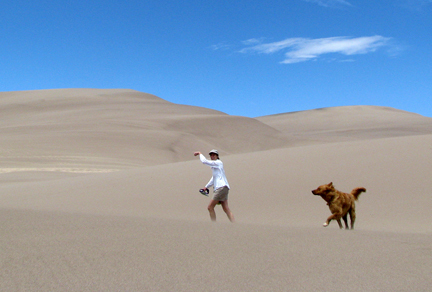 Patrice and Jake explore the Great Sand Dunes National Park & Preserve. Photo by Michael Baum. Here’s my favorite business writing tip: Write your first draft, taking time to re-read the copy and give it a good polish. Next, walk away for an hour – or a day! Walking away helps to give you distance – literally and figuratively! When you come back, you’ll take a fresh look at the content you wrote. You’ll be surprised how much perspective and objectivity you will gain. What do you do next? Edit to ensure content is crisp, clear, and compelling. Now, go back to your writing. Pretend someone else wrote the content. Put on your editor’s hat. It’s time to edit ruthlessly! Write a more enticing headline. Ensure every sentence is as clear as possible. Add subheads to strengthen structure. Proof to fix spelling, grammar, and punctuation errors. Add a call-to-action at the end. More on this business writing tip . . .
Why do I consider this to be the best business writing tip EVER? Because “walking away” can help you to objectively look at and edit your article, blog post, worksheet, brochure, and book. Do this every time, and you WILL improve your writing – and your message. When editing, I like to print out the page(s). Surprisingly, reading a piece of paper – versus staring at the screen – adds even more perspective and objectivity. Also, when editing, I like to use a red pen. If you find red ink daunting (perhaps you’re haunted by harsh teachers wielding red pens), then use green, purple, blue, or black. The color doesn’t matter. What matters is taking time to thoroughly – and ruthlessly – edit your content. When you walk away – then come back later to ruthlessly edit your writing – your content will be crisp, clear, and compelling.